Planting Apple Trees from Seed. I’ve noticed when buying apples in the grocery store now a day the seeds in the core have already starting sprouting. 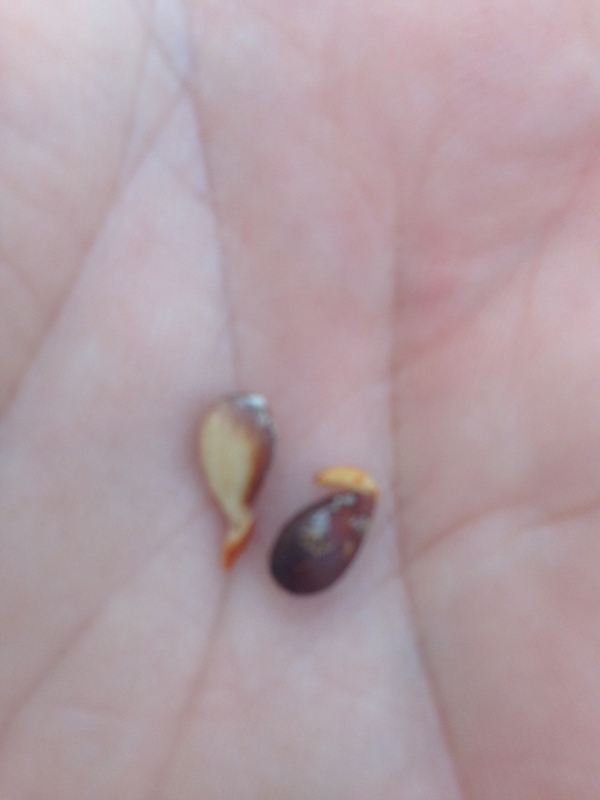 Apple seeds need to cold stratify for about 30 day in order to sprout. So these apples have been stored cold for a month before reaching the store. Little food for thought. 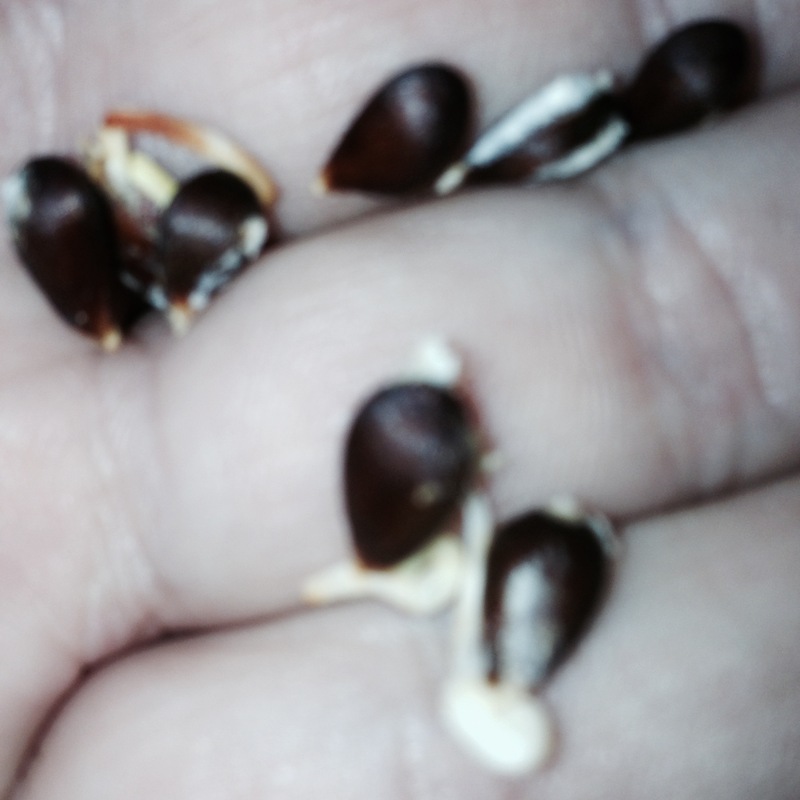 I have planted these seeds in four in pots to see if they grow. I have planted ten so far. Even though some have sprouted I still have to cold stratify those that haven’t. To cold stratify apple seeds place them in a damp paper towel. Then into a zip lock bag, and place the bag into the refrigerator for about 30 days. Afterwards take out the bag and let it sit at room temperature till sprouted. Pot them up. When starting seeds this way. Keep in mind that the fruits will not be true to type. Granny smith seeds will not produce true Granny Smith apples. Apple trees must cross pollinate with another tree like Honey Crisp. If you keep that in mind, and don’t mind surprise apples enjoy free trees. I want a true to type apple on at least a few of these trees, so I plan to graft scion of Granny Smith and Honey Crisp onto these stock. This may take a year to get the size enough to graft. Next installment of Hare Razor. The bunnies are nearly two weeks old. Their eyes are opening, and of course they are cute. Enjoy! Please comment and subscribe to my YouTube channel. Manures and composted plant materials add organic matter, which helps soil retain moisture and structure which prevents compaction, and helps prevent nutrients from leaching away. They also balance extremes in soil pH. The most common sources of manure are horses, cattle, goats, sheep, rabbits and poultry. Below is a guide showing how manures measure up, nutrient-wise. While all animal manures are good sources of organic matter and nutrients, it’s impossible to make a precise analysis, mostly because bedding materials vary so much. For example, manure with straw or sawdust will have a different nitrogen composition than pure manure. But it’s useful to know whether the manure you’re using is rich or poor in a particular nutrient such as nitrogen. As you review the list, don’t be misled by the N-P-K numbers that suggest manure is less powerful than chemicals. It is actually far better because it contains large amounts of organic matter, so it feeds and builds the soil while it nourishes the plants. This is one of the primary ways that organic fertilizers have a leg-up on chemical ones. Still, many gardeners can’t resist comparing the numerical amounts listed below with what they read on packages of synthetic fertilizers. Unfortunately, the values of manure and organic fertilizers in general, are often based on the relative amount of nitrogen (N), phosphoric acid (P) and potash (K) they contain. While these are important elements, “it is misleading to make a direct comparison between farm manures and chemical fertilizers on the basis of the relative amounts of N-P-K,” says Jerry Minnich, author of Rodale’s Guide to Composting. Just like we need to eat to maintain our health, soil needs continual replenishment of its organic matter to decompose into humus. 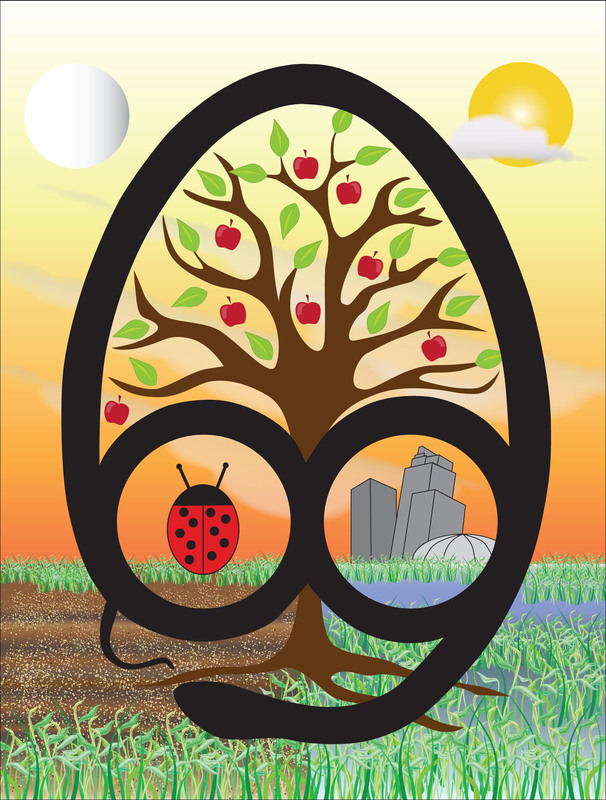 Humus helps create a rich, moisture-retaining soil and makes nutrients available to plants. Poultry manure (chicken in particular) is the richest animal manure in N-P-K. Chicken manure is considered “hot” and must be composted before adding it to the garden. Otherwise, it will burn any plants it comes in contact with. “Dairy Manure may be the single most useful soil-builder around,” says Ann Lovejoy, lifetime organic gardener and writer in Seattle, Washington. “Washed dairy manure from healthy cows is just about perfect for garden use; it can be used as a topdressing and for soil improvement,” she adds. Dairy manure is preferable to steer manure, which has a higher salt and weed seed content. Though cow manure has low nutrient numbers, that’s what makes ist safe to use in unlimited quantities. Horse manure is about half as rich as chicken manure, but richer in nitrogen than cow manure. And, like chicken droppings, it’s considered “hot”. Horse manure often contains a lot of weed seeds, which means it’s a good idea to compost it using a hot composting method. Steer manure is one of the old standbys, but it’s not the most beloved because it often contains unwanted salts and weed seeds. Rabbit manure is even higher in nitrogen than some poultry manures and it also contains a large amount of phosphorus–important for flower and fruit formation. Sheep manure is another “hot” manure. It is somewhat dry and very rich. Manure from sheep fed hay and grain will be more potent than manure from animals that live on pasture. No matter what kind of manure you use, use it as a soil amendment, not a mulch. In other words, don’t put raw manure directly on garden soils. Raw manure generally releases nitrogen compounds and ammonia which can burn plant roots, young plants and interfere with seed germination. In fact, it’s recommended that all animal manure should be aged for at least 6 months. Many gardeners spread fresh manure in the fall and turn it in to the top 6 inches of soil a month before spring planting. While the chance of contamination is slim, severe sickness and even death may occur if contaminated produce is eaten. To be safe, either compost your manure or apply it in the fall after harvest. Wash up after handling manure and don’t forget to rinse the vegetables and fruit well before you eat them–always a good idea whether your use manure or not. Anywhere from 75 to 90 percent of the plant nutrients fed to animals are excreted in their manure, so it should be no surprise that the stuff is an excellent fertilizer. I’m going to do this with my rabbits. In life work is never done. Being free, living life as you see fit, work is never done. I’m in the middle years of my life (I hope), and sometimes I feel that I don’t have the time to get many things that I want to accomplish that I want to. Build up my land, planting trees and such. No matter what I am doing, and no matter what needs doing I remember what I do, what we do matters. It matters to ourselves, our families, our community, and planet. “Society grows great when old men plant trees for which their shade they will never sit under.” My children will benefit from all the work my wife and I are doing. My children enjoy the fresh fruits and vegetables that we grow. They benefit from working in their own gardens learning responsibility. Learning to live a free and self reliant life. Learning to help care for those who may need help. Even to be able to help. 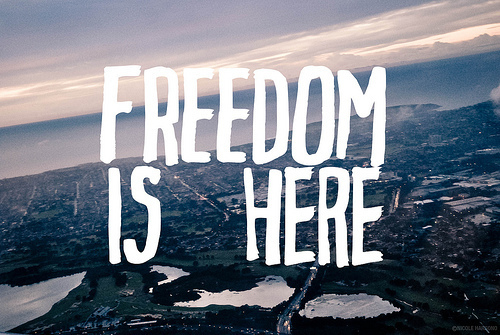 Learning to be debit free, and not slave to any lenders. While I still have breath work is never done. Making cheese is one of the easiest and most satisfying tasks that you can accomplish in the homestead kitchen. While there are many wonderful cheeses out there to try, I recommend a simple farmer’s cheese to get your feet wet and familiarize yourself with the basic process. The great thing about this recipe is that it doesn’t require specialty ingredients; it can be made with either store-bought or farm-fresh milk, and it is ready to eat within a few hours. I also love the fact that it can be flavored with any number of herbs and spices to suit your personal taste. 1. Heat milk over low heat to almost boiling. 2. Pour in lemon juice. 3. Strain the curds. 4. Twist the straining cloth to remove as much whey as possible. The curds should stay together in a ball. 5. Add the butter while the curds are still hot. 6. Add salt and other seasonings. In a heavy stainless steel saucepan, heat milk over low heat to almost boiling. I never use a thermometer; I know it’s ready when the milk forms a skin over the top and little bubbles begin to form around the edges. Once the milk is ready, remove from heat and skim the skin from the top with a spoon. Then, pour in half of your lemon juice. You should see the milk begin to separate into firm white curds and thin yellow whey. If it doesn’t seem to be separating, add the rest of the lemon juice and continue to stir. The whey will be clear to slightly milky and the curds may be very fine or clumpy, depending on the type of milk that you use and its exact temperature. Strain the curds through a cloth-lined strainer or colander. I use a heavy flour sack dish towel so that I don’t lose any of the finer curds. If you want, save your whey for baking, as a starter culture for fermented foods, or give it to your chickens … it is full of nutrition! 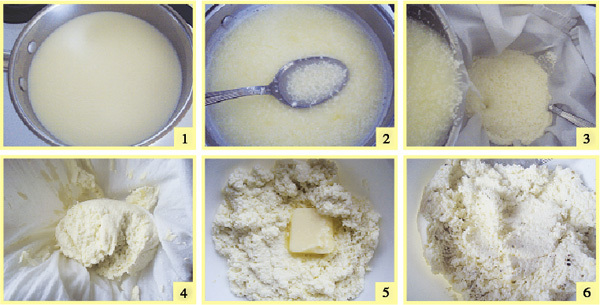 Gather the curds up in the cloth and twist it to remove as much whey as possible (be careful, it’s hot). 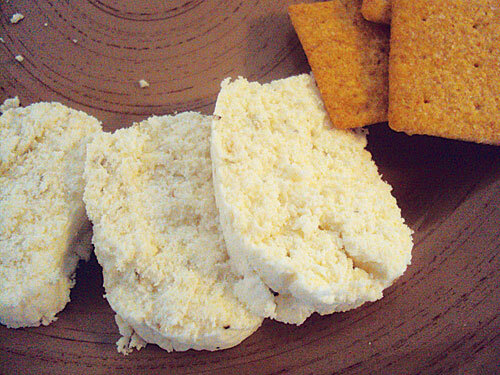 The curds should look fairly dry and hold together in a soft ball. Transfer to a bowl and add the butter. Take a spoon and mash the butter into the curds. You want to make sure that you do this while the curds are hot. At this point, they may feel rubbery and stiff, but if you continue to mash, they will eventually become soft and relatively smooth. The smoother they are, the better the texture of your final product will be. This can take up to 10 minutes. You can speed the process by using a small food processor, but I like to do it by hand so that I can “feel” the texture of the curds. Cheese making is part science, part art. When you feel that your curds are as smooth as they can get, add a pinch of salt, a dash of pepper, and whatever other seasonings you want. I love a combination of oregano and garlic. Dill, rosemary, and cayenne are also tasty. Mix well. With your hands, form your cheese into a small, firm log. At this point, if you want, you can roll the log in additional herbs, finely chopped nuts, or seeds. Wrap it in plastic wrap and chill for several hours. The finished product should be soft, but firm enough to slice. Bear in mind that cheese can be temperamental, so it may not turn out exactly the same every time. I have never had a batch that was inedible. I’ve had a few “whoops” batches that were crumbly, or too soft to slice, but they still had a terrific flavor and we enjoyed them on salads or as a spread. If you have a batch that turns out exceptionally well, make notes on exactly what you did so that you can repeat it the next time. You can make larger batches of this recipe, using up to a gallon of milk. The cheese will keep for a week or so in the fridge. Square Foot Garden lends itself easily to companion planting. A companion planting guide such as this one will show you which vegetables and flowers support or inhibit the growth of other plants and/or which pests they deter. Comments: radishes deter cucumber beetles. Chervil makes radishes hot. Lettuce helps make radishes tender. Nasturtiums improve radishes’ flavor. Comments: improves vegetables’ flavor and growth. In keeping on with Square Foot Gardening here is a nice video Square Foot Gardening 101.